To give your kitchen a truly authentic look, consider installing a copper farmhouse kitchen sink. Copper has a living finish that changes with age, giving your kitchen the truly rustic look you're after. A farmhouse sink or farmer's sink is a large, apron front sink that is installed on top of your cabinets, with an exposed front and the sides flush with the counter. The front of the sink may be left bare or decorated in an artistic pattern. Farmhouse sinks are typically installed in rustic, Tuscan and farmhouse style kitchens and may be made of china, stone or exotic metals such as copper. Unlike stainless steel, which gives a polished, modern finish to the kitchen, copper lends a softer, more antiqued feel to the room. Copper sinks have what is called a living finish; they darken, lighten and verdigris unevenly depending on where they are touched, how often they are touched and what type of products come in contact with their surface. While some copper farmhouse sinks are available in a polished copper finish, most are already antiqued with a light or dark coloration to help speed the aging process. This finish is typically preserved at the manufacturer with a light coat of carnuba wax. Over time, hot water, dish soap and the oils from your fingers will remove the wax and your sink will begin to change. Areas that are touched daily will lighten and take on a polished look, while the apron front of the sink begins to darken. Hard water, salt and lemon juice will cause your sink to verdigris or begin to turn green in places as well. These are not defects and should be considered part of the beauty of the sink. If you are installing a rustic or farmhouse style kitchen and wish to add the beauty of a copper farmer's sink to the room, keep several things in mind to achieve the best installation. Your sink base cabinet is the portion of your kitchen cabinets left open for the sink plumbing. A farmhouse sink requires a specially shaped cabinet to support the large front apron on the sink. Plan well in advance for a farmer sink, select your copper sink and give the measurements and weight to your kitchen cabinet maker before ordering. A copper sink can weigh as much as much as 50 pounds and because most sinks are handmade, your sink should be shipped to the cabinet maker during cabinet construction. Any variation in the size of the sink will need to be taken into account at this time; copper farmhouse sinks are not recommended for existing cabinetry. 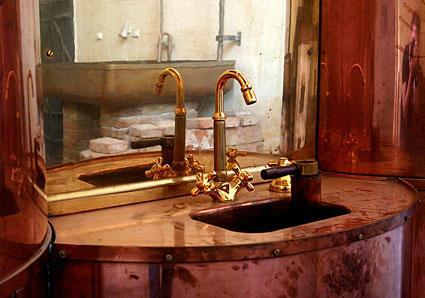 Nearly any type of countertop can be used with a copper farmer's sink. Avoid using tile counters, or laminate counters, because these will not fit the edges of the sink as well as a slab counter. To compliment the aged look of the copper, consider a soapstone counter or flamed granite counter. Depending on the size of your sink, you may be required to mount your faucet from the wall behind the sink, on the corner next to the sink or on a bridge behind the sink. Ordering your sink first, having your cabinet made to order and selecting your countertop all before choosing your faucet will help you make the decision for the rest of the plumbing. While a living finish, which changes with time is a prized characteristic of the sink, harsh chemicals and cleansers can strip the finish from the sink, artificially giving it a polished or verdigried appearance. To protect your sink, clean it with old fashioned furniture polish and wipe it dry with a soft cloth after each use. When installed and cared for properly, a copper farmhouse kitchen sink is the perfect finishing touch to many kitchen designs.